All lanes have now re-opened on the A27 at Chichester following a serious collision involving a lorry and a truck. Police, fire crews and an air ambulance were called to the scene of the crash at 4.20pm on Monday afternoon (June 8), which happened eastbound on the Chichester bypass. All lanes have now opened between the Whyke Roundabout and the Bognor Road Roundabout, though traffic is slow-moving. 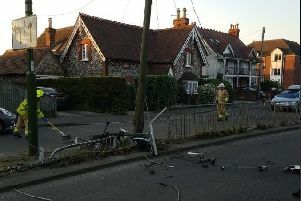 Sussex Police said the collision between a pick-up truck and a lorry happened at 4.20pm and fire crews had to use hydraulic rescue equipment to free one man trapped in one of the vehicles. He was later taken to hospital, though his condition has not yet been confirmed. There is congestion up to the Fishbourne roundabout, on the A286 Market Avenue to the South Street junction and on the A259 Whyke Road to the Blackberry Lane junction.